This document describes the data formats used when trading partners exchange procurement information electronically. It is prepared as part of the initiative taken by the Norwegian “Agency of Public Management and eGovernment” (Difi) within the standardization of electronic procurement. The European Single Procurement Document (ESPD) is a self-declaration document intended for preliminary evidence in a public procurement procedure. The requirements are first set by the Contracting Authority (CA), in an ESPD request which is part of the call for competition. The Economic Operator (EO) answers the requirements from the Contracting Authority in a corresponding ESPD Response, and sends this ESPD Response to the CA with the tendering documents. This EHF is based on the work done by DG GROW. DG GROW has developed a data model, XSD schemas and validation artefacts (schematron) for the exchange of the ESPD between any Procurement stakeholder’s system. This document illustrates in detail how to use these artefacts in OpenPEPPOL. The document that is filled-in by the Economic Operators stating whether they fulfil or not the criteria required in the ESPD Request, and providing the sources where evidences can be obtained to prove that the criteria are met by this EO. 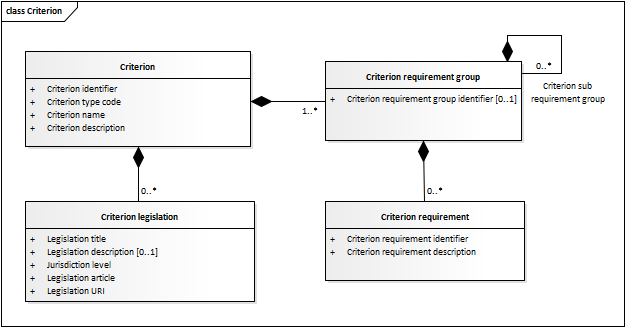 This document explains and illustrates how to implement XML documents based on the Data Model and XSD Schema from the European Commission, as well as any specific requirements for use in the Norwegian marked (EHF specific rules and restrictions). The ESPD data model (ESPD-EDM) is rich and flexible enough so as to allow ESPD instances for contracts above and below the threshold. However this document is oriented exclusively to illustrate how to create ESPD electronic documents for contracts above the threshold. Many of the requirements and recommendations expressed in this document MAY NOT be valid for contracts below the threshold. However, from a purely technical point of view, this document MAY be used to understand how the ESPD data model works, and to create, in a normalized way, XML instances containing criteria for contracts below the threshold. 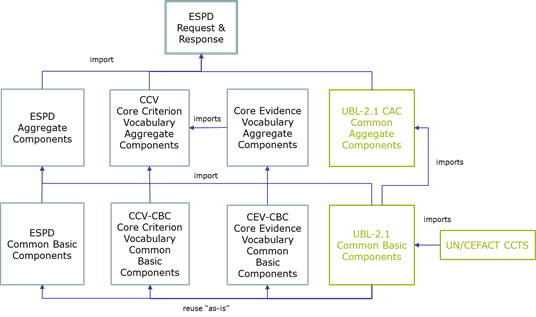 The ESPD Exchange Data Model (ESPD EDM) re-uses three other models, that were defined in parallel to the ESPD, the Core Criterion Data Model, the Core Evidence Data Model, and the OASIS UBL-2.1 common information components. The figure below presents a high-level view of this data architecture for the entire ESPD-EDM. The blocks coloured in green represent libraries of components defined by the UBL-2.1 Technical Committee (TC), whilst the rest have been defined from scratch by the EU Commission (COM) ESPD development team. The blocks represented in the figure represents either a document (e.g. ESPDRequest and ESPDResponse) or a library (the rest of the blocks). Per each document or library one XSD Schema has been implemented. Each Schema has been assigned its own namespace and a specific prefix representing the namespace. The table below lists the file names corresponding to each block, schema, namespace and namespace-prefix. 2 "espd-cac", prefix for the Common Aggregate Components defined by COM for the ESPD, e.g. "espd-cac:EconomicOperatorParty"
3 "espd-cbc", prefix for the Common Basic Components defined by COM for the ESPD, e.g. "espd-cbc:SMEIndicator"
5 "cac", prefix for the Common Aggregate Components defined in UBL-2.1, e.g. "cac:ContractingParty"
6 "cbc", prefix for the Common Basic Component defined in UBL-2.1, e.g. "cbc:TypeCode"
1 Notice that in the XML instance namespaces that are not referred to in the XSD schema of the ESPDResponse document are needed as they instantiate elements from other inner schemata of the data architecture, e.g. "cev:Evidence"
When creating a new ESPD Request XML document, the Contracting Authority (CA) specifies the series of exclusion and selection ''criteria'' that the Economic Operator (EO) has to satisfy for a specific Procurement Project. In the ESPD Response, the Economic Operator (EO) MAY provide where to get evidences that prove it satisfies the criteria required by the CA. Two new data models were defined from scratch by the European Commission (COM), the Core Criterion Data Model and the Core Evidence Data Model. Once implemented as XSD schemata these Data Models are named ''Core Criterion Vocabulary'' and ''Core Evidence Vocabulary''. Both Data Models (and therefore the vocabularies too) are interrelated. From the modelling perspective the main difference between the ESPDRequest and the ESPDResponse is that the ESPDRequest does not use the Response element, and therefore neither the XML Core Evidence Vocabulary. Below is an overview of the ESPD data model, showing the business information content and cardinality. The classes marked in blue are not used by the ESPD Request, only by the ESPD Response transaction. The classes that are white, are used by both the ESPD Request and the ESPD Response. Criteria are at the core of the ESPD and is used to describe a condition that the economic operator has to fulfil in order to not be excluded and be selected as a candidate for awarding in a procurement procedure. The two main groups of Criteria relevant for the ESPD are the ones required in the Directive, Exclusion and Selection criteria. This section gives a detailed view on how to specify each of those criteria. Its content is aligned to the Norwegian ESPD standard form establishing the standard form for the European Single Procurement Document. 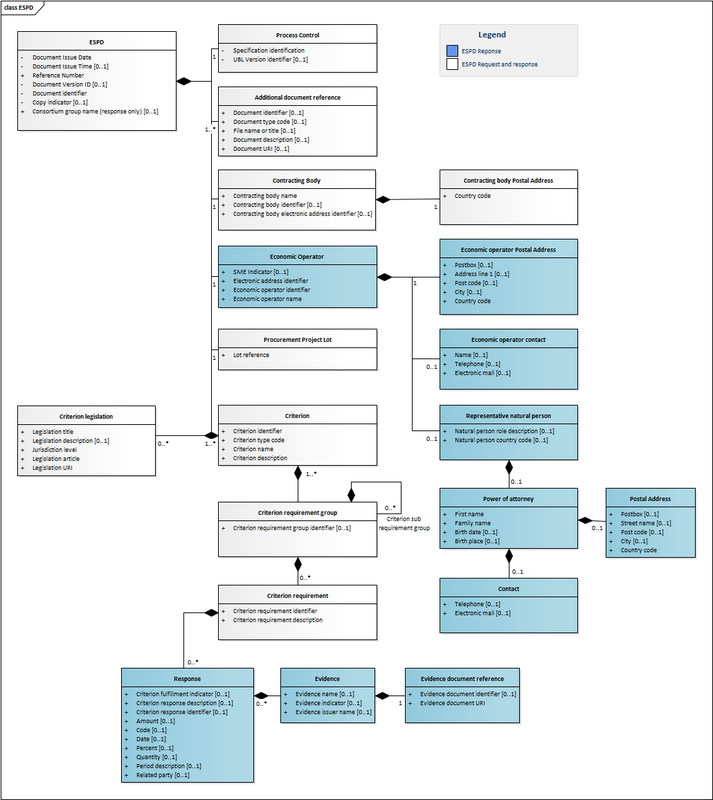 The UML diagram below shows in detail the classes of the Core Criterion used in the ESPDRequest XML document. This EHF ESPD is based on the ESDP datamodel from the EU commission, and its method of structuring the criterions. Each criterion has a defined set of requirement groups and requirements, all documented by the EU Commission in the Criteria Taxonomy. Please note that a file with all criteria and their corresponding Norwegian translation are provided, to enable the Norwegian text in user interfaces. Please note that requirement groups can be nested within other requirement groups. The first requirement of a requirement group is reserved to ask a question where the response is an INDICATOR (boolean true or false). The attribute pi of the requirement group element is used to determine if the requirements and nested requirement groups must be answered expicitly or not. If the INDICATOR is set to true, the group and nested sub-groups must be answered. This is the case for all the exclusion criteria. If the INDICATOR is set to false, the group and nested sub-groups must be answered. Valid for some of the selection criteria. Figure 3. 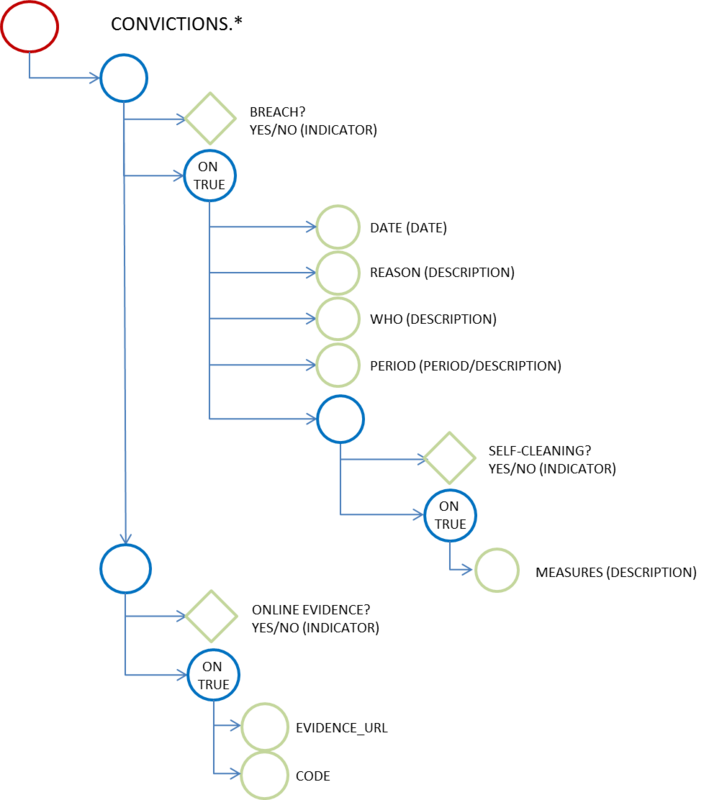 General data-structure design for criteria and requirements with a ''yes'' or ''no'' answer"
If the response to the requirement is "Yes" (ON TRUE) the EO will have to provide the date of the conviction, the reason, who was convicted and for how long. If the response is "No", then the EO will proceed providing data about whether there’s online evidence or not regarding to the absence of conviction (if that is possible). This behaviour repeats per each subgroup of requirements: the deepest subgroup of the structure for the group 1 will have to be filled by the EO in case a requirement has a "Yes" in the response to the requirement Self-Cleaning. Evidence is used by the economic operator to refer to a trusted source of proofs that supports the stated response to a criterion requirement. 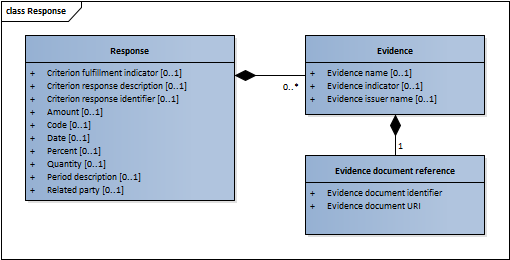 The UML diagram below shows in detail the classes of the Core Evidence used in the ESPD Response XML document. This chapter describes selected blocks of information that is used in both the ESPD Request and Response transaction, providing valid snippets of xml code. The contracting authority or contracting entity who is buying supplies, services or public works using a tendering procedure as described in the anskaffelsesforskriften and forsyningsforskriften. The contracting body must be identified, hence information about the party is required, such as party name, identification, endpoint id, and country. The ESPDResponse was explicitly designed to hold data about one single Economic Operator. Thus, the ESPDResponse Exchange Data Model associates a class EconomicOperatorParty as a placeholder for the data related to only one Economic Operator (EO) that tenders solely to a procurement project, to one of the EOs that tender as part of a group (e.g. a Consortium), or to one possible sub-contractor of the EO. Consortia grouping more than one EO need to draft and submit as many ESPDResponses as Economic Operators and sub-contractors participate in the tender. The ESPD reuses this UBL-2.1 component to allow both the contracting body (in the ESPDRequest) and the economic operator (in the ESPDResponse) to include references to documents that they might consider relevant including in the XML instances of both types of documents. The URL where to access its content. Example of additional document reference used in the ESPDRequest XML document. All ESPD Response instances MUST always include an Additional Document Reference indicating the TeD reference number of the Contract Notice the ESPD is related to. This reference number MUST be specified in the field cbc:ID of the element cac:AdditionalDocumentReference component, and MUST follow the scheme defined by the Publications Office: /S - (e.g. 2015/S 252-461137). Example of additional document reference used in the ESPDResponse XML document.